Now you can feel like you’ve entered prehistoric times with the new Jurassic World Kids’ Suites at Loews Royal Pacific Resort at the Universal Orlando Resort! Little ones will be transported to the island of Isla Nublar from Jurassic World and have the opportunity to sleep among the dinosaurs! From the second you open the paddock door, you have entered the world where Velociraptors, Pterodactyls and even the Indominus Rex roam. Laying down in bed will feel like you’ve entered your very own gyrosphere ride and you’re maneuvering through the jungle terrain. The carpet will help guide them as it looks like the valley map with trail markings the gyrospheres followed. Even the bedding will take them to the island. It is made to look like a test tube that was used to create new species of dinosaurs just like in Jurassic World. The kids’ suites sleep up to five with one king bed, two twin beds and an option for a rollaway bed. Mom and dad can have a little privacy, while kids can have some fun in their own attached themed room. The kids’ room opens into the adults’ room, connected via a door modeled after the dinosaur enclosure. So take a prehistoric adventure 65 million years in the making! You can Jurassic Park inside Islands of Adventure at Universal Orlando and then your kids can sleep among the dinosaurs in these new Jurassic World kids’ suites. 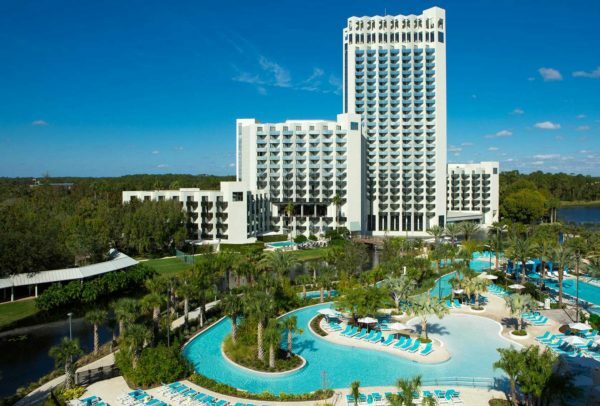 One of the benefits of staying at Loews Royal Pacific Resort is that you’ll also receive a Universal Express Unlimited two-park pass for everyone in your party, which allows you to skip the regular lines on rides like Jurassic Park River Adventure. So what are you waiting for? Isla Nublar awaits! Book your stay at Loews Royal Pacific Resort in a Jurassic World Kids’ Suites today!